To kick off homecoming, more than 500 students worked together to prepare about 100,000 meals for people in need — mostly from the local area, but also around the world — at an annual service event Saturday in Stamp Student Union. This university’s Homecoming Committee teamed up with new student group Terps Against Hunger to plan the event that used the national nonprofit Kids Against Hunger’s three-step process to feed the hungry. 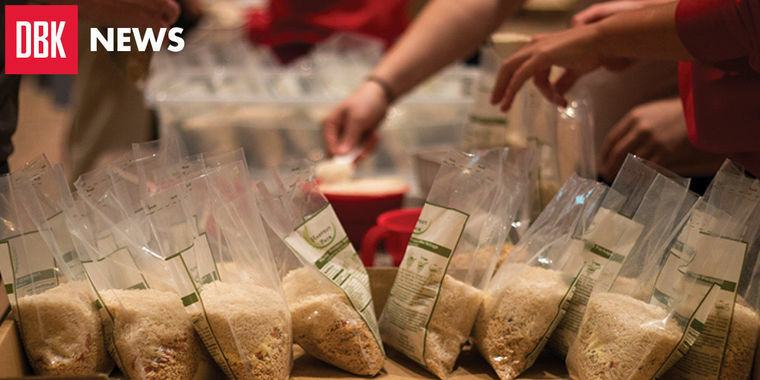 Volunteers participated in one of three steps: combining four key ingredients — soy, dehydrated vegetables, rice, and vitamin and mineral powder — weighing the bags to ensure accurate nutritional facts or sealing and packing the bags for shipment. Each bag contains six nutritious meals that avoid dietary restrictions such as meat, said Jonathan Fix, Terps Against Hunger president. “We try to keep it as basic as possible because we want to be able to ship to anywhere,” said Fix, a senior individual studies major. Students Helping Honduras will take its meals to Honduras during its annual service trip this winter. The majority of the meals will stay in the local area, including this university’s Campus Pantry, Prince George’s County, Montgomery County and Washington. “We’re trying to find different groups to work with, especially ones that work with children and give meals to malnourished children in the area,” said Fix, who is a board member of Kids Against Hunger for the DC Metro chapter. Junior Ankur Naik, the homecoming undergraduate programming assistant who ran the event, said that this service project is different from past events because volunteers hope to make it an annual project. Senior Gabrielle Taylor came to volunteer with her roommate for an hour. They worked to fill the bags with the ingredients. Taylor came on her own, but many groups, such as Greek life, service organizations and professional fraternities, also showed up to volunteer. Junior Pat Hopkins came with members of his fraternity, Phi Gamma Delta. They participated in Terps Against Hunger’s event last spring, which only involved members of Greek life. Professor Robert Grimm, Center for Philanthropy and Nonprofit Leadership director came out to volunteer. It was during Grimm’s class on social innovation that Fix started Terps Against Hunger. “It’s exciting to see them develop a high impact philanthropy event that gets a lot of students across campus involved and is on track to get bigger in impact and reach,” Grimm said. And that is where Fix hopes his organization is headed: growing bigger and better. Due to a reporting error, a previous version of the article identified a student as Pat Hopains. His last name is Hopkins.